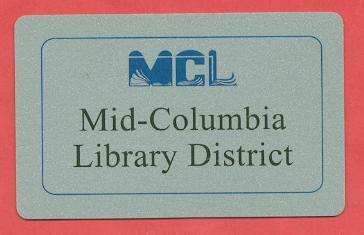 A few years ago, Megan traveled through the age-old rite of passage that is obtaining her very own, very first library card. She had been begging me for one for months, but the prerequisite for this shiny, steel-gray gem was the child’s ability to write her first and last name without help. Megan was but a wee preschooler at the time, and despite her parent’s conviction that she was surely a genius (our child? could she be anything but? ), the little darling could not yet patch “Megan” and “Smith” together without a bit of prodding by mom. When the blessed day arrived that she could finally do so, she marched up to the desk, signed the form, and emerged triumphant with her first (of what I fear will be many) credit-card-of-sorts. She felt grownup and proud, and I thought the whole episode was so cute. Until today. Meg had an unusually voracious appetite for books at the ‘ole Mid-Columbia Library today, and she wanted to check them out on “her” card. (Out of convenience, we usually use mine for the whole family.) I agreed, and she whipped that baby out of her embroidered back pocket with the flair of Poncho Villa. She slapped it down on the desk, shiny as new, and waited for some service. A pale blond woman, whose white face disappeared into whiter hair, sat behind the desk. She scanned the card, then peered down her bifocals at the young patron with a smile/frown. I felt Megan’s hand stiffen in mine, and saw her flinch behind a calm face. Ten dollars! Ten dollars! Such a sum of money! I stood quietly, unsure whether to lecture or reassure my daughter. Before I could speak, she looked up at me with her toffee-drop eyes and said, “Mom, I think I have enough allowance to pay for that.” I wanted to hug her. She didn’t even consider asking me to pay for it, though I had already begun wondering how I could justify doing so. Her sweet offer, however, gave me a perfect launch into Teaching Responsibility. Her upper lip visibly stiffened as she braced herself to part with such a dear sum of money. How I wanted to pay it for her, and relieve her suffering! But I dared not, for then what would become of this child? She may go through life without an understanding of care, responsibility, even the value of a hard-earned dollar. No, I must be strict, much as it tore at my pulsing mother-heart. For the good of my children, I would set an example of careful accountability. After all, they would someday take after their mother. Passing on my discipline and frugality was the least I could do.